J. Cole will be the next hip-hop star to be interviewed on MTV's "RapFix Live", when he sits down with Sway tomorrow (February 3). The interview will stream live at 4 p.m. on RapFix.MTV.com. Fans can submit questions to be answered by J. Cole by tweeting @MTVRapFix with the hashtag #rapfixlive or if they upload videos to Your.MTV.com. If you don't know who J. Cole is, you probably don't follow hip-hop too closely. But for a refresher: He's a Fayetteville native who took his musical aspirations to New York, where he attended St. John's University (boy's got smarts), dropped a critically acclaimed mixtape, and became the first artist to be signed to Jay-Z's Roc Nation label. I've blogged about Cole a few times before. 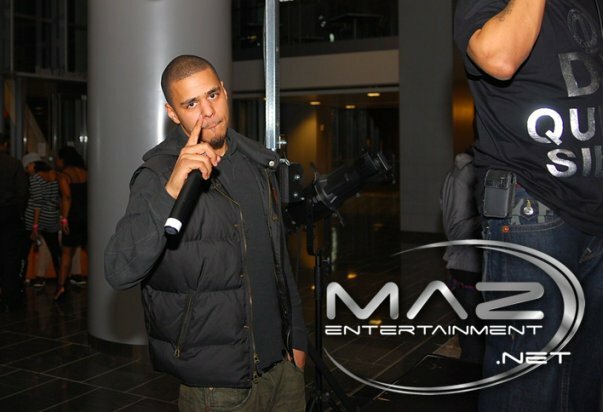 J. Cole, pictured here at a MAZ Entertainment party in Charlotte last year. His debut album is one of the most highly anticipated in hip-hop. And the pressure of having "Jay-Z protégé" attached wherever his name is mentioned has to be weighing heavily on him, though it has opened several huge doors for North Carolina's most popular rapper since Petey Pablo. I love that you keep supporting J Cole and posting updates about him.